It used to be that when I surfed the net, I was anonymous. If I wanted to comment on a forum or blog or group, I could use my name or create a new one. I was an unknown. I'm now often astonished to be linking at some random website and see that there is a list of recent visitors that includes me. Amazing and scary. 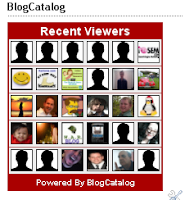 I think they do it through my blog catalog identity.In fact, if you look to the right side of this column, you'll see a recent visitors box put there by blogcatalog which tracks visitors. I also have been amazed to visit some groups on the web and find that I have another persistent identity which has announced me. My Ning ID. Of course, once we get started on this, I realize that my blogger ID appears everytime I try to comment on a blogger-based blog. On the other hand, I have a number of wordpress blogs and my identity does not seem to travel with me. Does anyone know what Wordpress identity is used around the web? Wordpress.org? .com? Or any wordpress blog that I've installed and it's just a question of activating something. I'm thinking about this since of course, the big one, is my Facebook and LinkedIn IDs which I've noticed a number of sites asking about recently. Lastly, I just accepted to update my Windows Messenger software (whatever that is) and in the notice, it talked about my Windows Live ID which I think is their effort to be the central internet passport office.